I swear on a stack of holy books, and that stash of Empire Strikes Back bubblegum cards I've carried since I was 7 years old, That I will finish writing an essay on Future Boy Conan. For some odd reason, I haven't found the time. Or, feel free to insert your own favorite excuse. For those who don't know, Future Boy Conan is Hayao Miyazaki's 1978 television series. It marked his directoral debut after more than a decade as an animator, layout designer, and overall idea man. He was heavily involved in such classics as Horus, Prince of the Sun (1968); Puss in Boots (1969); Animal Treasure Island (1971); Lupin III (1971-2); Panda Go Panda (1972); Heidi, Girl of the Alps (1974); and 3000 Leagues in Search of Mother. Then there are other, more minor work on Toei films such as Ali Baba and the 40 Theives (1971) and The Flying Ghost Ship (1969), but for the sake of my playing for time, we won't delve into that here. Future Boy Conan was Miyazaki's first chance to completely create his own work, one that indulged in his passions and examined his complex worldview. He wrote the scripts, created the characters, and directed all but two episodes. He was aided by longtime partners Isao Takahata (who directed episodes 8 and 9), Yasuo Otsuka (animation director) and Yoshifumi Kondo (key animator). At this point, I would normally go into greater detail, explaining the overall plot to the 26-episode series, its general themes, and some of my favorite moments. I'd also tell everyone living in North America that they're missing out on one of the great classics of Japanese animation, one of Miyazaki's milestones. And, then, just to rub it in, I'd point out some of the many Conan riffs to appear in the Studio Ghibli movies over the years. Unfortunately, I don't have the time today to get into that. Perhaps a little later. This weekend, or maybe sometime after I get back from my vacation on the moon. But, rest assured, I will complete my review, and it will either be really cool, or it will be really, really cool. Top that, Douglas Adams. 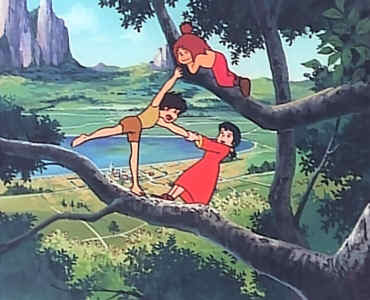 Until then, I wanted to share this screenshot from Conan, featuring the three main characters: Conan, Lana, and Jimsy. It's a really good picture, isn't it? Now I'll bet you're really jealous. Don't be. Just go to www.animesuki.com and download the fansub copy of Future Boy Conan. See? You read all this way, and you won a prize. Aren't I nice? You should send me some money. No, really, you should send me some cash. I need to finish college before I start collecting my pension. And, yes, I will finish the Conan write-up before too long. Bear with me. Great blog you have here, thanks for sharing all this information! I'm an animator and I personally think Conan is the best Tv show ever made! Thanks a lot! We're glad to have you here. Feel free to jump into any conversation you wish, and steal whatever you need. One of these days, I'll have to sit down and write a lot more about Future Boy Conan. It's such a terrific series, and probably the one Hayao Miyazaki opus that perfectly bridges his younger (slapstick) and older (apocalypse)periods.